I am a woman engineer and a mentor, and the numbers of women in STEM are too low. As an engineering professor of the practice who researches underrepresentation and gender equity in science, I am always appalled to see that out of more than 27,000 faculty in engineering, only 100 of them are African-American women like me. It is my mission to not only increase the number of women who go into STEM fields, but to increase the numbers of women who will use their talents for humanitarian purposes. I am encouraged! One of my former fellowship students, Erica Dasi, is an Environmental Engineering PhD student at the University of South Florida (USA). She is working on biologically removing nitrogen from small community drinking water systems. Her work, in service to humanity, and similar work by others, inspires me to do more to motivate and train women who will become professors -- the multipliers to train the next generations of women in STEM. As a little girl, I wanted to become a nurse, but my father told me to be a doctor, because "girls were doctors too." As I took more math courses, I was placed in pilot programs for the public schools such as "after school algebra" classes, and summer "Introduction to Engineering" sessions at the local community college. I was told that I should go into engineering because I had high grades in math and science. My father taught me that I could have more options as an engineer, and that an engineering background, with math as a base, could reduce the incidences of discrimination. His stance (in simple terms) was that if 1+1 = 2, and if I professed that 1+1 =2, then it would be an objective measure and I would be judged by that measure, and not by gender nor race. It was a great concept. While I have not escaped discrimination, I have been able to stand my ground as a woman in STEM. I studied digital signal processing and received Bachelor and Master of Science degrees in electrical engineering, a PhD in Speech Science, and conducted research to enhance technologies for people with disabilities. I became a university professor, and later an administrator, creating professional development programs and influencing policy to prepare students to excel in their degree programs and in the STEM workforce. Serving as a university administrator, Assistant Dean, and later Associate Vice Provost, I directed several multi-campus programs, such as the PROMISE: Maryland's Alliance for Graduate Education and the Professoriate (AGEP) and the University System of Maryland's Louis Stokes Alliance for Minority Participation (LSAMP), both sponsored by the National Science Foundation (NSF) in the U.S. These programs increased the numbers of women from underrepresented groups who received PhDs in STEM fields from universities in Maryland. As director of these programs, I have enjoyed being a mentor to many of the women, and have watched them graduate and advance in their careers, becoming STEM professionals and mentors, each in her own right. In the moments of celebration, there are also moments of sadness as I remember the ones who we lost. We lost a brilliant math scholar to breast cancer, and a talented chemical engineer to murder. My life, mission, and trajectory changed after that. I was never the same, and was determined to make sure that my work focus on holistic approaches to professional development that could advance women, and save lives. Jessica Soto Perez was one of my PROMISE students in Chemical Engineering; she was killed by her husband, on the university's campus. It was a devastating experience! I worked with the police to identify her body and grieved with her family in Puerto Rico. I was determined that we wouldn't lose any other women to domestic abuse. The "Jessica Alert" and the "Jessica Effect" were initiatives that were born out of this tragedy. The "Jessica Alert" was a concept that was introduced to women faculty at a conference in Puerto Rico, empowering them to be "on the alert" for signs of trouble that might manifest among young women in their labs. Through the "alert," I asked the professors to consider allowing the women to bring boyfriends and husbands into the academic spaces, so that they could be connected to the women's professional endeavors. The "Jessica Alert" led to the "Jessica Effect," which is now part of all PROMISE and LSAMP programs for the University System of Maryland. The "Jessica Effect" is a practice of "family and friend" inclusion. Programs like PROMISE formerly focused only on the needs of the students. Now, family and friends are actively "recruited" and invited to events. Further, faculty and administrators are encouraged to recognize and value the cultural and familial connections of their students. Families are invited to conferences and workshops and are taught to understand the university experience and academic processes. The "Jessica Effect" has been effective at reducing feelings of isolation on the part of both the students and family members. Invoking the "Jessica Effect" has expanded opportunities for family members to offer their students the support necessary for degree completion, and for life as a whole. Projects for students and women in particular led to invitations to speak in several countries in Latin America to share best practices with faculty and students at conferences of the Latin and Caribbean Consortium of Engineering Institutions (LACCEI). The messages of gender equity in STEM, respect for women in laboratory environments, and attention to recognizing and addressing origins of abusive relationships were soon taken around the world as I spoke at conferences in Dubai, Korea, Australia, Italy, and Taiwan. 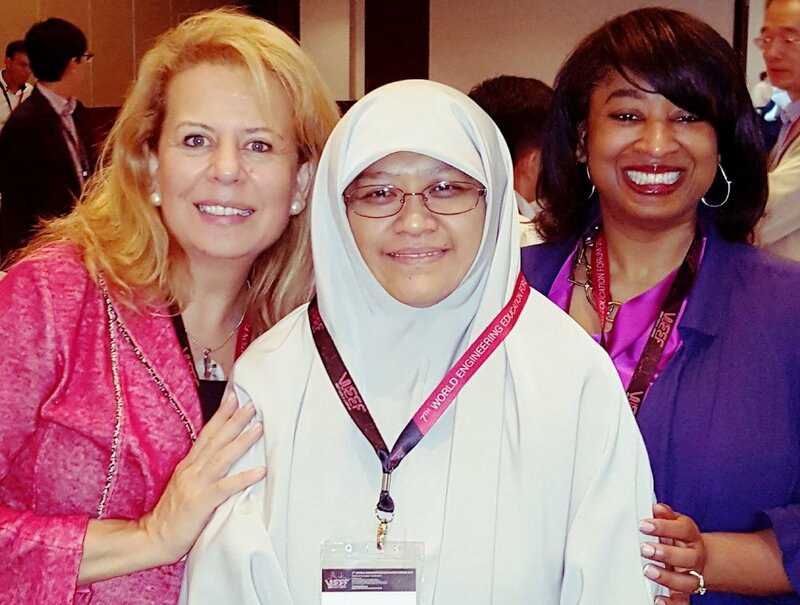 These experiences led me to teach more about "Humanitarian Engineering," and I now focus on recruiting and retaining women in STEM through sharing the intersections of the National Academy of Engineering's Global Grand Challenges (GCs), and the United Nations' 17 Sustainable Development Goals (SDGs). It is exciting to teach new generations of women that they can design their work around issues such as "Restore and Improve Urban Infrastructure" (GC #6), "Secure Cyberspace" (GC #7), "Clean Water and Sanitation" (SDG #6), and "Climate Action" (SDG #13). Dr. Renetta G. Tull is Associate Vice Provost for Strategic Initiatives at the University of Maryland, Baltimore County (UMBC), Professor of the Practice in UMBC’s College of Engineering and IT, and directs several pipeline professional development programs for the University System of Maryland (12 institutions). Tull earned engineering and science degrees from Howard University and Northwestern University. Tull co-led Puerto Rico’s ADVANCE Hispanic Women in STEM project and leads the “Women in STEM Forum” for the Latin and Caribbean Consortium of Engineering Institutions. Recognitions include: 2015 O’Reilly Media “Women in Data” cover, 2015 Global Engineering Deans Council/Airbus Diversity Award Finalist, and the 2016 ABET Claire L. Felbinger Award for Diversity. She is a Tau Beta Pi “Eminent Engineer,” serves on a mentoring committee for the National Academies, and is a United Nations Educational, Scientific, and Cultural Organization (UNESCO) team member for the next international engineering report. She engages on Twitter @Renetta_Tull.